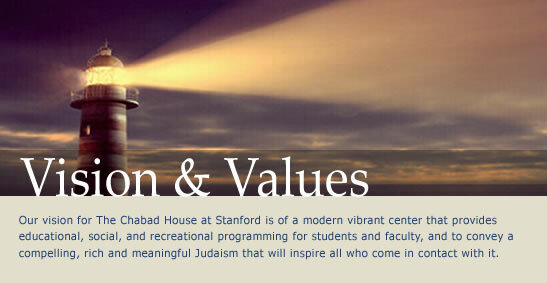 The values that lie at the heart of The Chabad House at Stanford are embodied in Torah and Jewish tradition. The Chabad House at Stanford is based on the ideology of Chabad, which has at its foundation the encompassing mitzvah "to love every Jew as one loves himself" and to permeate that love with Acts of Kindness and Mitzvahs. It's our belief that every individual Jew has an indispensable contribution to make to the totality of the Jewish people. Chabad seeks to engage fellow Jews at their own pace and comfort level through innovative educational programs in all areas of Jewish life. The Chabad House is a meeting place for social, religious, educational and cultural events and where students seek guidance and advice for whatever issues life presents. Chabad House is available and accessible to every student in the Stanford community. Among our programs, we host weekly Shabbat dinners that provide Jewish students an intimate setting to eat, meet new friends from every niche of the Stanford campus, and celebrate Shabbat in a spiritual and intellectual stimulating manner. Creative Holiday programs on the Stanford campus raise Jewish consciousness and pride throughout the community. Lectures and classes on Jewish law, philosophy, and ethics, teach the relevance and share the beauty and depth of our heritage to our leadership community. We continue to meet with students individually around the clock. Our efforts to engage the unaffiliated, and increase the opportunities for the affiliated, have been met with incredible success. For many, Chabad at Stanford has been their first positive Jewish experience. Leaders on campus have expressed wonder at Chabad's ability to seamlessly bring together a diverse community of undergraduates, graduates, faculty, and Jews of all backgrounds on an ongoing basis. Thousands of students have had their connection to Judaism deepened because of the work of Chabad. Funding Being that we interact primarily with a student community, we provide all our programs and services free of charge. No one is ever turned away. The support for our programs comes solely from alumni, parents and friends.